For a busy, growing office, the Epson AcuLaser C9300D2TN large capacity A3 colour printer is a cost-effective choice with versatile media handling, connectivity, and outstanding expandability. The AcuLaser C9300D2TN duplex A3 colour laser printer prints in colour and supports advanced Epson technologies, which help improve the machine's performance and output quality, but the expensive initial price and upgrades are some of the setbacks. This is a professional-looking machine with a matte boxy frame that measures 499.5mm wide, 698.4mm tall, and 538mm deep, and weighs 52.4Kg. It has a 150-sheet output tray capacity and two default input methods, including a 155-sheet multipurpose tray. The AcuLaser C-9300D2TN colour laser printer has a backlit monochrome LCD screen that displays up to five lines and 22 characters. It runs on a 400MHz processor with 256MB of memory. The printer uses AcuBrite toner system. It warms up fast and it can be upgraded for an optional Type B or parallel interface, as well as for a one-gigabyte memory. There is room for three additional paper cassettes in the Epson C9300D2TN colour printer. Two-sided printing is supported. Media and paper handling is versatile. The Epson C9300D2TN AcuLaser supports AAM technology, 4800RIT resolution, and PDL. Buying a double pack of Epson AcuLaser C9300D2TN printer cartridges is a good way to cut the running expenses. 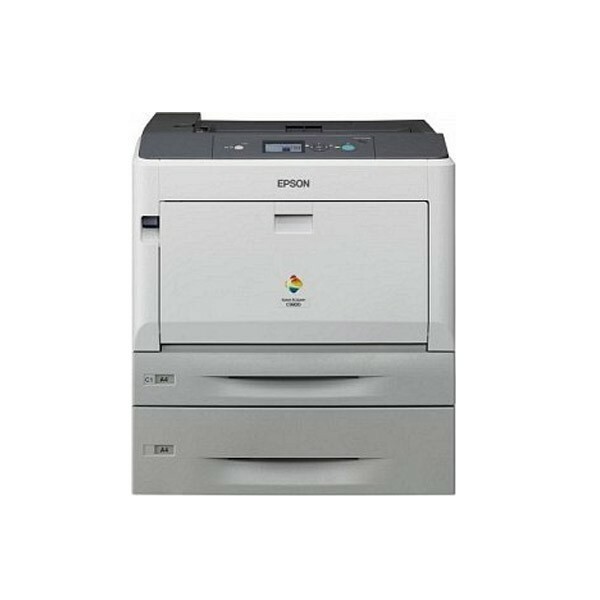 The Epson C9300D2TN printer is expensive to purchase and upgrade. It doesn't have built-in Wi-Fi. A larger office might need to buy another printer because the paper capacity is only up to 2,055 sheets. The C-9300D2TN laser printer is also criticised for its weight and the small display screen.